Employers & Practical Marketing Curriculum. The University of Arizona (UofA), an award-winning public university based out of Tucson Arizona, has gone to incredible lengths to help bridge their students & alumni to career opportunities among all of their colleges. While the giant academic institution has created numerous career-ready programs both internally and through third-party partnerships, they hadn't yet narrowed down a program for students interested in marketing and advertising. Not only that, but marketing students have the ability to take top-notch curriculum directly in their business programs, but the programs still lack practical and real access to hiring employers in the public relations, advertising, and marketing fields. These are just a few of the reasons, UofA began partnering with Six Bricks to bridge the gap for students seeking career-readiness in the field of marketing. Six Bricks provided a foundational, yet highly actionable 6-course eLearning path. Students had access to instructors & coaches who could give career and marketing advice. Students presented marketing projects to hiring employers around the valley. Student's who completed their coursework and presented winning projects to employers were awarded certificates of completion by both the University of Arizona & Six Bricks. Six Bricks facilitated access to students looking to connect with peers in the program. Six Bricks worked with the University of Arizona to nail down a 6-course eight-week Fast Track path, that introduces students to critical marketing topics such as B2B, Content Marketing, Paid Media, Email Marketing, Segmentations, Promotion and so much more. Not only did these students attend an active and accessible eLearning program, they also had the opportunity to work on real-life marketing projects with hiring employers within the state of Arizona. The UofA students not only had positive feedback about the program but for many, this program solidified their career-goals in marketing & public relations. 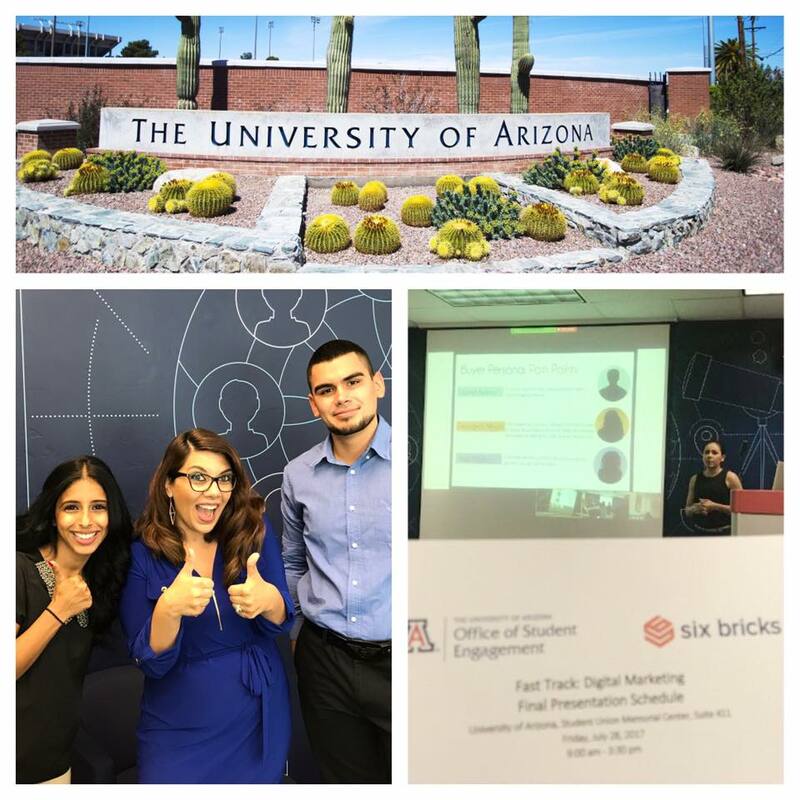 Through the Six Bricks platform, students were able to take courses throughout their busy summer months, while connecting with their peers, and working with career coaches both at Six Bricks and the University of Arizona to talk about any and everything marketing. After students pitched their real-marketing projects to employers, some students were prompted with the opportunity to intern for the companies as well, making the program a success all around. Don't just take our word for it, hear some of the stories students shared while they attended the program. I loved that lessons like the one in the Digital Marketing Basics course gave a step-by-step guide of how to determine a target market. This was such a fun way to learn digital marketing, in a very fast and simple way! Glad I was part of this program and was able to present to an awesome employer like Tallwave on a brand proposal. In the Email Marketing course, it became very very clear to me that understanding of how to formulate successful Call to Action (CTA) buttons can create higher conversion rates. Only 42% of employers feel marketing graduates are prepared to enter the workforce.